I spent the last half of September exploring New Zealand. This is a trip commonly made by Peace Corps Volunteers in Samoa as the flight is only about 3 and ½ hours and relatively cheap. This trip is doubly exciting to us as most of us are going somewhere we’ve never been before AND it’s a westernized nation which means it has lots of yummy foods and drinks that we miss in Samoa. It’s pretty cool. 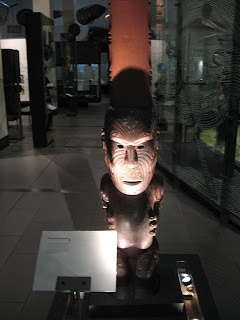 My trip began with me missing all of September 17; New Zealand is only one time zone away from Samoa, but the international date line lies between the countries so a day is jumped or repeated depending on which way you’re headed. I happen to have lived September 30, 2008 twice. It makes you think about how arbitrary our way of thinking of dates kind of is. 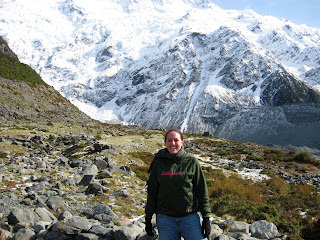 My friend Crystal met me in New Zealand after a much longer flight from San Antonio, TX. She left Samoa in May so it was good to see her. We then made plans as to what the main things we wanted to were. The list consisted of seeing Mt. Cook, cruising Milford Sound (a supposedly amazing fjordland in the south of the southern island of NZ), and a glacier hike. Unfortunately, the weather prevented all of these things so our trip was a little less exciting but, luckily, the scenery we saw while driving around was still pretty amazing! NZ is a country that rivals the US for melting pot status. 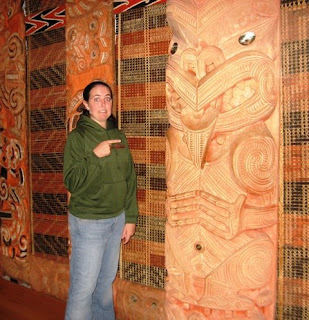 There are many people from all over Asia and Europe who’ve moved to NZ to work and live. As well as other implications this may have, it means that the food is incredible. I ate my way through this trip, taking advantage of international food courts that housed foods from Malaysia, Thailand, India, China, Japan, and other I can’t remember and the many Subway sandwich shops that exist in all the major towns of NZ. Between these and supermarkets which carried things like bagels and cream cheese, I was happy as a clam. OK, enough about food. Here’s what we actually did. Auckland – A very hilly city that is the not capital of NZ. (a poster corrected me on this) We were only here for a few days and most of that was taken up with me trying to see some doctors that aren’t available in Samoa. Not exciting. 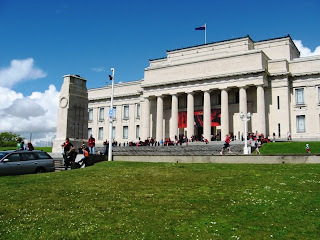 Then Crystal and I checked out the Auckland Museum which covers Maori culture(the traditional Polynesian culture of the islands), more modern history, and the natural history of NZ. Here are some pictures. 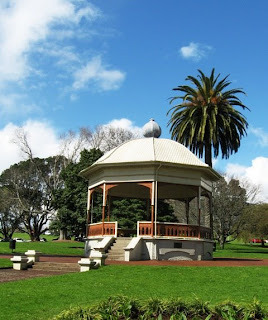 This was a pretty gazebo in the large park that housed the museum. This is the museum itself. If you look closely, you can see many children in red and black uniforms. Field trip day!!! We tried to keep one step ahead of the herd of children through the museum, but they were very well behaved so it was ok when we failed. 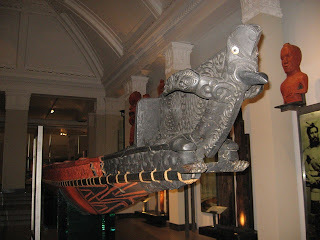 This was the end carving of a pretty impressive and very long boat. This is my friend the penguin. We’re thinking about stuff. 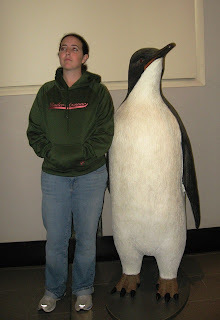 New Zealand has some penguins in most southerly regions. It’s an interesting country which goes from tropical to arctic (Antarctic?) with relatively little land mass. This is just another carving but it makes me laugh so I thought I’d include it. 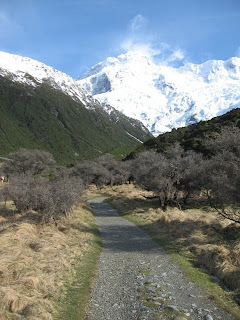 Then we were off to the South Island. Christchurch is a city that is amazingly like an English one. Picture a small English city, and that pretty much Christchurch. This was the backyard of the first hostel we stayed in. 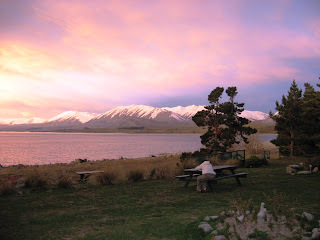 It’s Lake Tekapo, pretty awful, right? Or first big plan involved doing some walking about Mt. Cook. Unfortunately, we arrived along with a terrible rain and fog weather system. It lifted just in time for us to drive off but I did get to take a little walk before we left. Crystal didn’t come with me on this walk so I had to get a group of Japanese tourists to take my picture. They were very happy to help me and then proceeded to many pictures with me. Haha, maybe they thought I was from NZ. 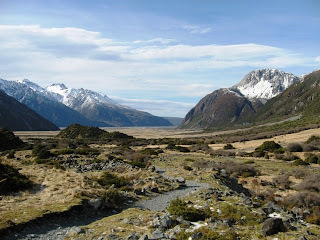 On another note, does it look like I’m in middle-earth on my way to Mordor. Yup, Lord of the Rings references were everywhere in NZ. And at the mercy of hostel common spaces in bad weather, Crystal and I managed to see 2 out of the 3 movies. The last one is still just too long. We stopped at a particularly scenic part of the drive. Crystal is taking a Samoan snapshot, hence the hand gesture. 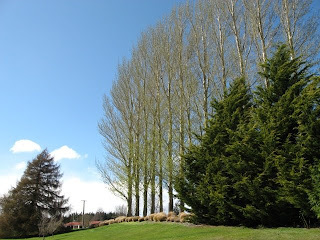 These straight rows of trees separated much of the pasture land. It made a fair amount of the countryside resemble an estate in England. A mudslide blocked us from checking out the fjordlands so instead we went on a farm tour. The couple breed sheep, deer and some cattle. They were very nice and even gave a us a sheep shearing demo. 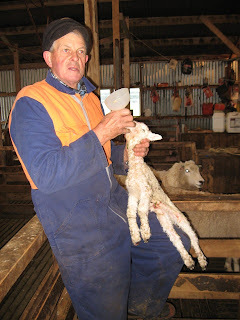 Here is the farmer force feeding a lamb. He collects the lambs that can’t feed or are neglected by their mothers and feed them till they are well again. 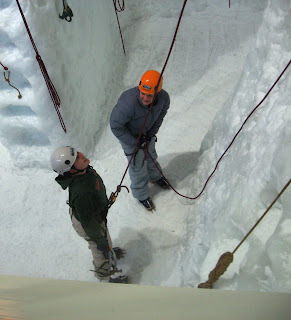 When our glacier hike got cancelled we checked out the glacier museum instead and I decided to try out an indoor ice climbing wall. This was probably the most fun I had on the whole trip and it definitely got my adrenaline pumping when I got to the steep tome parts of the wall. 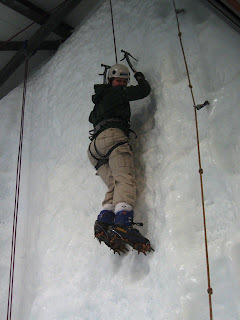 I did 2 ½ climbs and was very sore afterwards. 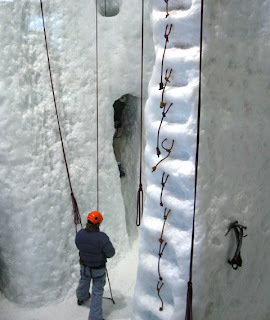 My hands were completely worn out due to the insanely tight grip I kept on the ice picks. Me at the bottom of my first climb. Don’t I look proud? After my first climb, I attempted this corner hike. (I'm the shadow in the corner.) It took me two tries as I only made it halfway up the first time. Then I had to give my arms and hands a break. By the top on the second try I was relying heavily on the belay ropes but I managed to make it up. It was a real rush. Soon after this Crystal left for the States and I spent my last two days soaking up comfortability in an amazingly small but very comfortable hotel. I need to go back some day with more time and some hiking gear. Now I’m back in Samoa to work till Christmas when I’ll take yet another vacation. I missed the food immediately but in other ways it is nice to be home…once I got here anyway. So, it’s been quite awhile since I’ve posted anything on here. Let’s just say I took the summer off…from the blog at least. On the other hand, this summer has been a busy one for me as a volunteer. 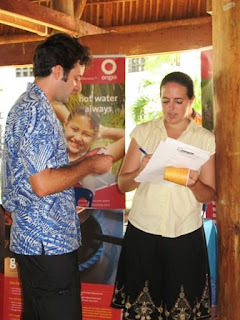 Due to the early departure of a friend and fellow volunteer, I fell into a role of co-organizer of Samoa’s Career Day. 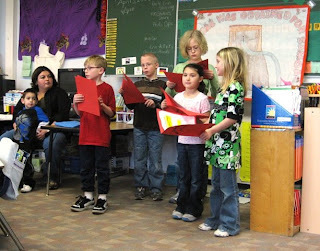 Career Day is an event that has been held for the past eight years. Career paths after the high school level are often a puzzle to young Samoans. Many see migrating away from Samoa, most commonly to New Zealand, Australia, and the US, as the best way to ensure a monetary income. 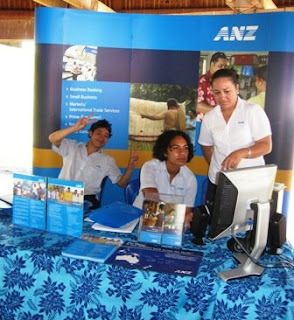 Remittances to families from relative abroad make up a healthy chunk of Samoa’s economy. 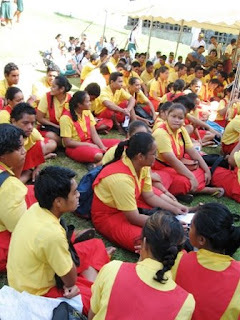 The idea of Career Day is to expose Samoan young adults to career paths and job opportunities that are available within the country. 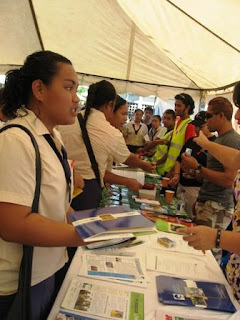 Career Day is held in conjunction with the National University of Samoa. Various local businesses and government organizations are invited to set up booths for the kids to visit. The participants can tell the kids about the job opportunities and explain any further education is needed for a career in their field. Then they can go visit the department of the college where they might gain that education. 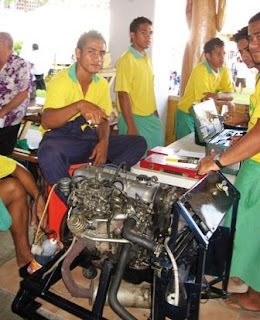 This year also included technical schools for arts and mechanical skills. Anyway, so I’ve made this sound pretty boring but it wasn’t really. Actually it was pretty exciting. Here are some pictures. Hopefully they’re more exciting than my written description. 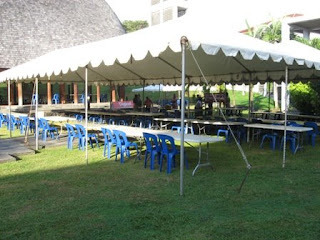 The tents to hold extra presenters before they arrived. The before pic. This is the inside of that giant Fale. There were close to two thousand kids at the event so there was lots of overfow out of the sides. 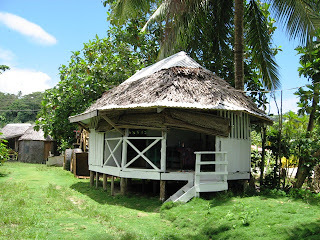 Luckily traditional Samoan buildings (Fales) don't have sides! And so it begins. 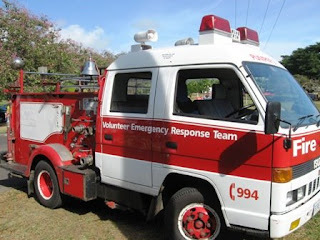 This row included the SUNGO (the local umbrella for Samoa's non-profits), the Samoan Aids Foundation, and Red Cross Samoa (the guys in the vests). Although the latter two may not provide many jobs, this is a great opportunity to spread the word about their programs and initiatives. AS of now I think there have only been about 8 cases of AIDS in Samoa. The aim is to keep the number that small. This is one of the Bank's booths. Fancy. The Fire and Rescue services came and brought their truck. Think you could work on one of these, Brian? This year we invited the technical and arts schools. This is the art school, Beautiful Expressions of Nature. 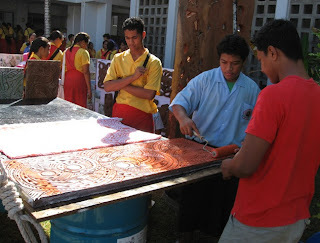 Here they are showing how to make the Samoan printed cloths. 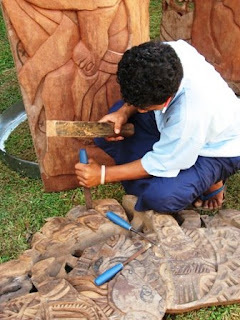 Here they are demonstrating sculpting. This was the Don Bosco display, a Catholic school that teaches skills such as plumbing and welding. They brought the welder...and gave demonstatrations!!! Safety Schmafety. This is physical proof that I have done work in Samoa. Yay!! Next to me is Tim, the President of Avanoa Tutusa. This is me being the commander of the food. Don't I look scary?!? Well, it’s been quite a while since I wrote my last post and a lot of stuff has happened since then. Most importantly to me was a visit to Germany to visit Mom and Dad. I’ve been back a month now and I’m still sad about leaving all the scrumptious food…um, I mean, Mom and Dad. While I was back I managed to fit in a short trip to Delft, Netherlands to see a college friend and Mom, Dad and I drove down to Garmisch to enjoy a last trip to the Alps and say goodbye to the town “for the last time.” Haha, that is, until we visit Tom after he moves. 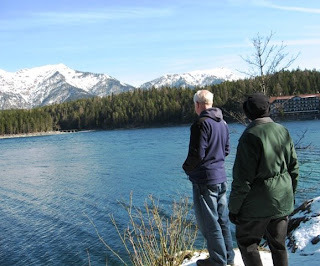 We did the things we’ve done there in the past including a trip to the Ettal Monestary and the Eibsee. I even got to see some snow when Dad and I drove down in a mini-blizzard. 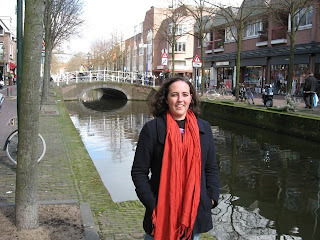 My visit to Delft. Very cute town. Mom and Dad at the Eibsee. Look at the snow!!! When I wasn’t traveling around, I hung out in Bitburg eating good food and drink. While I was there, I was able to visit the Class with which I correspond. This is the Learning Center run by Lydia Banuelos. For those of you who don’t know, there is a program called WorldWise Schools in which a Peace Corps Volunteer is paired with a class in the States. 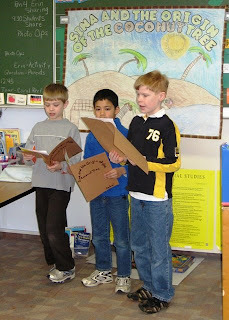 In my case, I was able to request the class applying from Mom’s school, Bitburg Elementary School. This class is made up of second, third, and fourth graders. During my visit, I gave a presentation about my life and work and then, following the Samoan tradition of reciprocity in big events, the class presented me with Samoan legends. 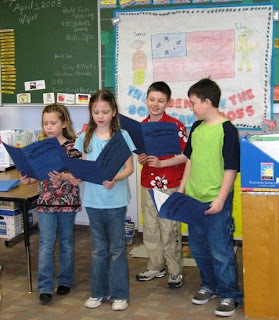 Here are some pictures of the class groups and the posters they made about the legend. Apologies to the class, those pictures are not the best but they’re all I have. Hopefully I can get some others from Lydia. We also got to try out some of the Samoan clapping dance called Sasa. The kids were very good and picked it up much more quickly than my training group did in training. They also tried out Koko Samoa, Samoa’s answer to hot chocolate. It something I really enjoy and is a testament to the fact that if you add enough sugar, many things will taste good. I want to send a big thank you to the class and Bitburg Elementary School for having me and showing me their work, including the very cool coral reef that all the students of the school have built in the cafeteria. Well, that enough for now, I will be sure to update much more quickly next time. We’re entering a busier time of year now, so hopefully I’ll have more to report. So it’s been a pretty long time since I updated this thing. The holiday season has come and gone, and now it’s almost March. I just haven’t been in a writing/sharing mood recently. But now that time has passed and I’m ready to write. The holiday season was pretty good. I have to admit I did miss the cold weather; here we have been working through the rainy (and hot and humid) season. I get the impression that it’s actually been a relatively dry rainy season, but it’s still hotter than when we arrived back in June. I actually had two trees for Christmas, one courtesy of Aunt Mary (Thank you!!!!) and another made from the decorations Mom sent me. As you can see, it definitely had a “wall-side.” Hehehe. Sorry bad joke but I think it had to be made. Also I feel I should point out that it was a little over 5’ 1/2”, not a bad size. 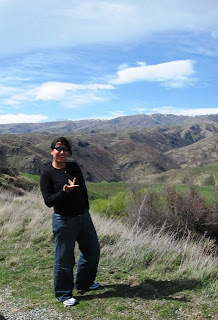 A fellow Peace Corps friend came in from her village to visit which was nice for some company. We made ourselves a really nice meal of fettucini alfredo and I made cake (that’s right I splashed out on the Betty Crocker). Overall, a quiet but nice holiday. At least I didn’t wreck my car and end up soaked and spending a couple hours in the Somerset, PA Sheetz station...just for example. For my birthday, a few friends came over and we had a feast which included homemade chocolate chip cookies, something I had not eaten in over 6 months at that point. Thanks to my roommate Hannah for that one!! We had brownies as my cake. Also not eaten in a long time…yummy. I feel like this is not that exciting. I didn’t experience a Samoan Christmas, but seeing as their holiday tends to focus more on the church going aspect of the holiday, I was ok with that. I just spent a lot of money on food and sat around eating it and watching dvds on my laptop with various friends that came to visit during the two week holiday. And that was good enough for me. I did venture out of the capital for New Year’s Eve. 15 of us went out to stay in beach fales and enjoy a sandy new year’s. 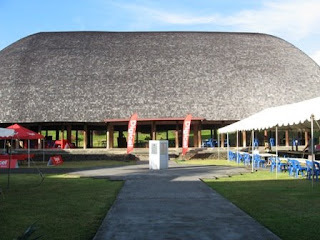 A beach fale is a miniature, wooden version of a Samoan fale, the standard building structure here. Both structures are open air with various devices for keeping out the rain. But so long as it’s nice out, the sides stay up to allow a nice ocean breeze to blow through. It was really nice at the resort. The beach was beautiful as you can see below and much fun was had in the ocean and by watching the stars at night. On New Year’s Eve there were many shooting stars. Whether or not that’s what we were actually watching, I’m not sure but it was pretty amazing. Since, the holiday season I’ve been trying to get back into work mode. There is a definite emphasis on the word trying since I’m not always sure what I’m doing here, but things have finally starting moving (slowly) in February, so that’s good. I attended my Early Service Conference two weeks ago. 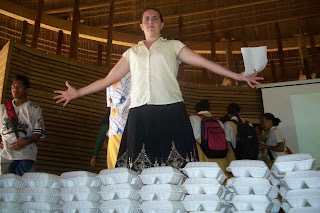 This is a weeklong event held 5 months (in our case) into Peace Corps Service. It’s pretty much a chance for a training group to get together after being at their sites for a while to regroup and reassess. It was very refreshing and it was great to see my group again. Well. That’s about it. Sorry it’s not more exotic or action pack. In a little more than a month I’ll be visiting Mom and Dad in Germany. Haha, it’s not Samoa, but I’m sure I’ll have some pictures to post. 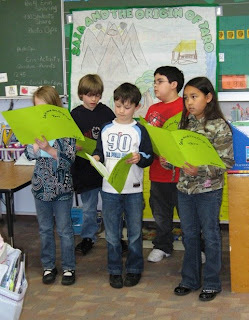 I’ll be visiting the class that I write to about life in Samoa and that’ll be exciting. An American twist on the Fa’asamoa. Till then. So this post took longer than it was supposed to but i'm goin to blame that on an illness that pretty much took me out of commision for about 2 full week. it was really fun, full of fever and headache and neck/back ache, too!!! but now that has passed (as of yesterday) and i'm feeling well without the aid of drugs. excellent. 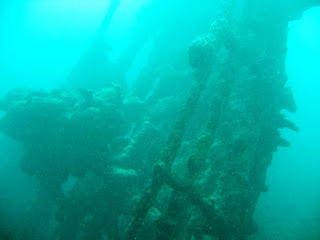 so anyway, here are my pictures of my 1st dive trip ever. i did do my certification dives in a quarry in northern virginia, but that's not really the same because 1) certification means little fun stuff and checking off requirements and 2) quarries are murky and cold, even in the summer. 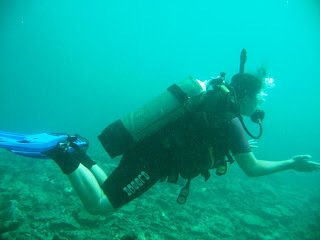 so this was my 1st salt water, warm, and interesting dive. it was off the northern coast of savai'i, the larger island to the west of upolu, my home island. we did two dives, one around a wrecked london missionary company ship a little over a hundred years submerged and one around a large expanse of coral. Before the dive trip i spent one night on savai'i with my work who were taking a group of visiting tongans for a small tour of the big island. we stayed at really nice resort in beach fales that were half enclosed. Here are a coupld pictures. 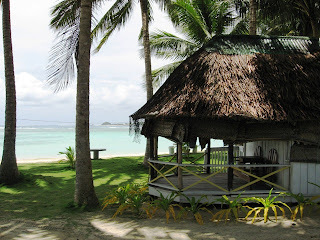 One of the Beach Fales we stayed in. Nice view right? This was my fale. It was tucked back so the view wasn't as nice but i'm not complaining. it was also cool because it was a paid business trip. nice! The next day work left but I stayed behind to meet up with the Samoa Dive Club. We had volunteers from the US, Australia, England and Japan on the outing which was on a long, holiday weekend. I didn't take a pic of the fale i stayed in for the next few nights. It was more traditional/rustic being all open with just little mattress on the floor, but also more comfortable oddly enough. I can't decide where to take Mom and Dad. Maybe we'll try out both. They're only about a five minute walk from each other. 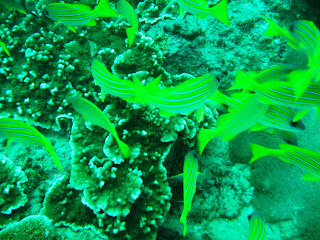 These are as close to nemo fish as we've seen. Yellow fin anemone fish. 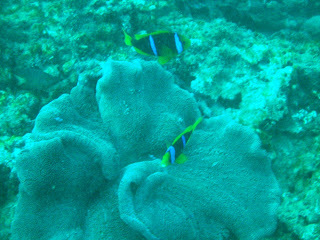 It's kind of cool because they pretty much just hang out around that giant anemone. My friend Jordan and me. She was the photographer. Me trying to find neutral bouyancy. hehe, not my strong suit. 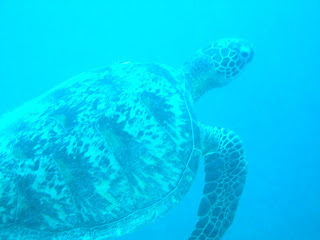 A green sea turtle. 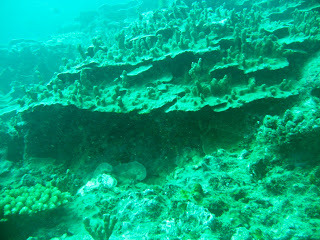 It was not this active during my dive. 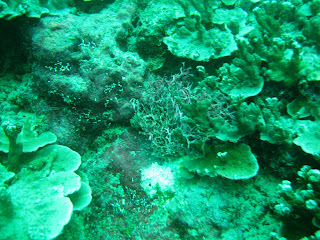 this was from the morning dive team. The shipwreck. Cool because it's all open so you can dive it without special certification. 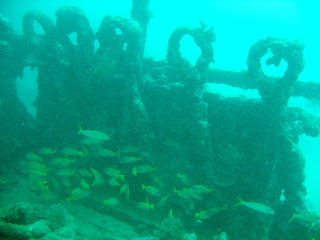 More wreck footage with the pretty fishes. So the dives went off without a hitch I was a little worried that I would be slow or behind because it was a year and three months since my certification but no worries. 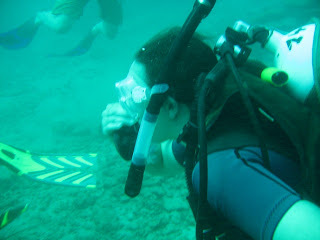 my dive master was really cool and calming. 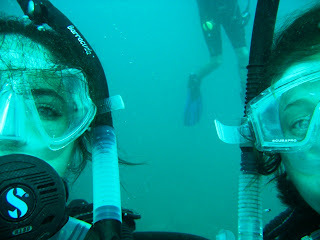 i can't wait to dive again and i hope Dad can join me next year! I'll have more stuff to post soon enough.